Botswana is one of Southern Africa’s most renowned and admired safari destinations. 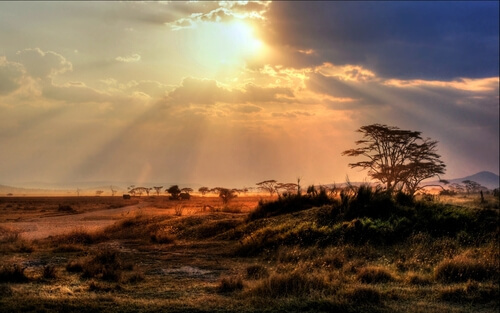 Its varied geography includes untouched savannahs, wildlife-rich deltas, arid deserts and vast salt pans. The country also has some pretty famous fans – Prince Harry and Meghan Markle enjoyed their first holiday together here and the Dutchess’ engagement ring features a diamond from Botswana. It’s little wonder that the royals adore Botswana. It is a warm and welcoming nation, with a small and well-educated population, embodied in Mma Precious Ramotswe, the delightful lead character in The No. 1 Ladies’ Detective Agency series of books by Alexander McCall Smith. It is one of Africa’s wealthiest nations, thanks to reserves of diamonds, gemstones and platinum, and a lucrative tourism industry that is focused on keeping tourist numbers low and experiences exclusive. The local currency is the Pula – 7 pula equate to about AU$1 and money can be exchanged at airports and major hotels. Botswana’s capital is Gaborone in the south-east of the country – close to the South African border. The city has just 300,000 residents. In fact, with fewer than three million people, who live in an area roughly the size of France, Botswana is one of the most sparsely populated countries in Africa, making it the perfect place to get away from it all. Botswana’s national parks are world-renowned, and for good reason. From deltas and deserts to grasslands and savannas, visitors can have a truly diverse and varied safari experience – from spotting hippos and elephants from a traditional dugout canoe to discovering arid desert areas. One of the country’s most famous attractions is the Chobe National Park, which is located in the Okavango Delta, one of the world’s largest inland deltas. Elephants are Chobe’s most famous residents – the park has the world’s largest concentration of African ellies. These giants live alongside other well-known mammals, including the other Big Five, as well as hundreds of birds that thrive in the wetlands. One of Botswana’s other renowned natural attractions are the salt pans, south of the delta. Here, look out for baobab or upside-down trees. In fact, these are the world’s largest succulents and Botswana is home to a number of historic species including one that is a national monument. Green’s Baobab is located in the largest network of salt pans in the world in the Makgadikgadi National Park. The tree has the date 1771 carved into it – thought to be made by an intrepid Portuguese explorer. Another favourite park is the Central Kalahari Game Reserve in the Kalahari desert – a great place to see cheetah, hyenas and wild dogs. Botswana is a landlocked country and offers easy access to the neighbouring countries of Zimbabwe to the east and South Africa to the south. This means that holiday itineraries typically include highlights in these other Southern African nations, too. 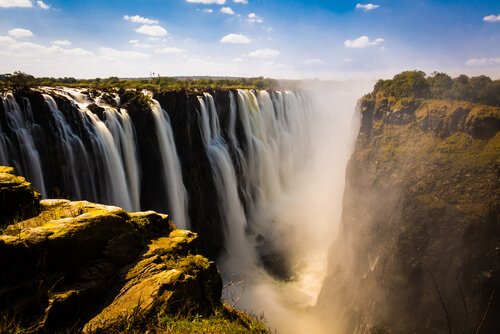 From Botswana, it’s possible to drive or fly to Zimbabwe – Victoria Falls and Hwange National Park are popular options. Victoria Falls, which borders Zimbabwe and Zambia, is one of the natural wonders of the world. British explorer David Livingstone was the first European to lay eyes on the mighty falls in 1855, but the local Kololo people have long known the wonder of the Mosi oa Tunya or, the smoke that thunders. Accessing the falls themselves is relatively easy – wooden walkways on both the Zimbabwe and Zambia side offer unparalleled views – don a raincoat and feel the power of the falls. And for those seeking an adrenaline thrill, Victoria Falls is home to one of the world’s most famous bungee jumps, power boating, helicopter flips and much more. The Victoria Falls is a top tourist destination, complete with a range of excellent hotels on both the Zimbabwean (the town of Victoria Falls) and Zambian (the town of Livingstone) sides. Many of these establishments are perched on the edge of the mighty Zambezi River. You might catch a glimpse of a hippo as you enjoy your morning cup of tea or witness a herd of zebra thundering over manicured lawns. South Africa borders both Botswana and Zimbabwe. Despite the nations’ proximity, each country has a distinct culture, languages and history, which means visitors will have a very different experience in each. Visitors who head south of Gaborone in Botswana can experience the magnificence of South Africa’s greatest and biggest national park, the Kruger. Located in the provinces of Limpopo and Mpumalanga, the park was established by president Paul Kruger in 1926. 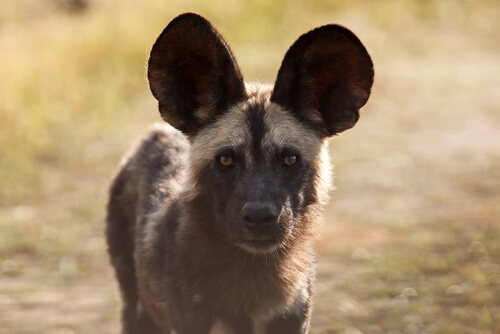 While the Kruger is steeped in history, including the grave of Africa’s most famous and loyal dog, Jock of the Bushveld, scientists continue to make new discoveries in the park. In recent years, crack-teams of anti-poaching units have been based here in order to combat rhino poaching. Depending on the country and the lodge, each safari experience will vary. There are some broad similarities, however. 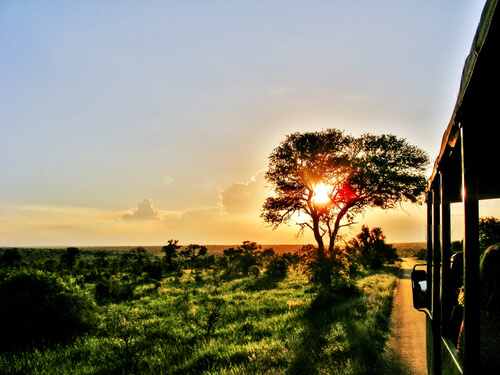 Typically, guests are guided by qualified rangers – either in an open-topped safari vehicle or on foot on bushwalks. Rangers are often accompanied by trackers who look out for animal spoor (footprints) and track wildlife. Vehicles are usually in touch with each other via radio, which allows rangers to share information about sightings or animal kills. On safari, expect to rise early – morning game drives leave lodges at dawn when animals are most active and before the heat of the day sets in. There will also be late afternoon drives when predators such as leopards, lions and hyenas are on the prowl. 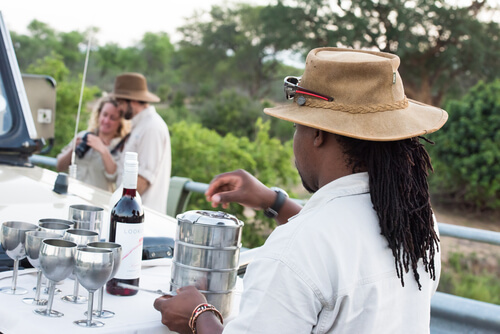 Game drives always include a refreshments break when guests can disembark the vehicle and enjoy a cup of tea or G&T (depending on the time of day!). Visitors are made to feel special with service that is second to none. Across Southern Africa, it’s customary to tip service staff, including rangers, trackers and cleaners. Some visitors might want to consider taking books, toys or stationary supplies for children at local schools. Subscribe now for our latest travel news and tour offers. 2019 Inspiring Vacations, All rights reserved. We see that you are based in but you are viewing that is meant for residents.